Today my guest is Ron Pattinson. Ron is a well known expert in historical beers, and has written extensively on English and Scottish beer history. 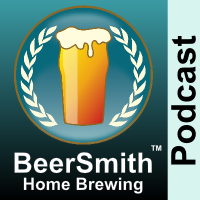 Ron is author of the Homebrewers Guide to Vintage Beer (Amazon affiliate link) as well as the definitive historical beer blog Shut Up About Barclay Perkins, where you can find hundreds of articles on the history of Scottish beers. We discuss what the “romantical” version of Scottish beers are versus the reality – which is that most of these beers were brewed near the large industrial population centers and many were created for export. In many periods the Scottish did not drink as much beer (per capita) as the English and during many periods Scottish beers were brewed with a strong eye to export. Ron shares some of his findings from comparing various Scottish and English ales from the 1830’s onward. We discuss the fact that while Scottish beers were often “strong” we find that the weaker table beer was more popular during many periods in the historical record. Ron discusses how, despite perceptions, many hoppy styles were brewed in Scotland including IPAs. He shares with us how hops were imported from not only England but also America and Europe to brew many Scottish beers. We discuss barley used in Scottish ales including “Bigg” which was a local variant of barley no longer in common use. Ron tells us why peat was not actually a flavor associated with the vast majority of Scottish ales, both because barley was not malted in areas with peat and also because they had better alternatives for malting such as coal and coke. We discuss the pubs in Scotland, which were not typically owned by the breweries as became common in much of England. We talk about the role taxation played in Scottish brewing. Ron shares his closing thoughts.